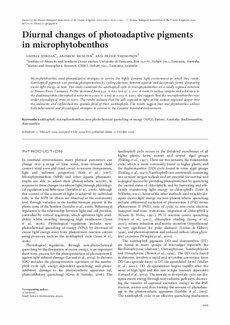 Microphytobenthos need photoadaptive strategies to survive the highly dynamic light environment in which they reside. Xanthophyll pigments can provide photoprotection by cycling electrons between epoxide and de-epoxide forms, dissipating excess light energy as heat. This study examined the xanthophyll cycle in microphytobenthos on a tidally exposed substrate at Browns River, Tasmania. Fv/Fm decreased from 0.52+0.01 to 0.47+0.01 at noon in surface samples and a decrease in the diadinoxanthin:chlorophyll-a ratio from 0.022+0.003 to 0.015+0.005 also suggests that the microphytobenthos was under physiological stress at noon. The results indicate that the cells exposed to light at the surface migrated deeper into the sediments and replenished the epoxide form of their xanthophylls. The results suggest that micrphytobenthos utilizes both behavioural and physiological strategies to survive in the dynamic intertidal environment.